Let your kids' imaginations loose in Flexa's bunk beds. Flexa's simple designs mean you needn't worry about their beds fitting in – they look neat in rooms of any colour, shape or size. 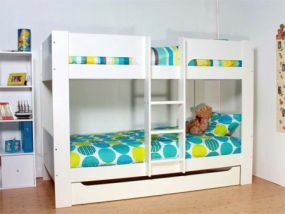 Because they're made from high-quality materials, Flexa bunk beds are both a fun and a practical choice. Flexa beds are strong, solid and are built with wide, central ladders, so climbing up into bed couldn't be easier. Also, the slats and head/foot ends are extremely secure, so those from toddlers to teens can live out their shipmate fantasies without you worrying about the bow breaking. All beds are offered as part of a mattress bundle, and because they also come with extra storage, toys can be kept safely under the bed - instead of all over the floor! With Flexa bunk beds, there's no excuse for your kids not to be dreaming.